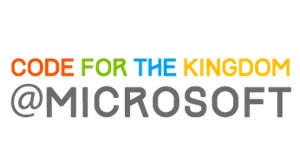 Code for the Kingdom @ Microsoft is a weekend event to be held at Microsoft inviting all Microsoft FTEs, interns, external guests, and volunteers. With the theme of “Tackling the Giants through Marketplace Miracles,” we will have three separate tracks: (1) traditional hack-a-thon (MS FTEs and interns only) (2) pray-a-thon (open to guests) and (3) kids’ hackathon (for kids of MS FTEs, 1-6th grade). We are marketplace professionals at Microsoft and our mission is to bring innovation, transformation, and even miracles to Microsoft, communities, cities, and to all nations. Our company’s vision is “Empower every person and every organization on the planet to achieve more”, which is also The Challenge for this year’s //oneweek Hackathon. However, often times we find there are the obstacles that block such innovation, transformation, and miracles from happening. Here, we refer such obstacles as the “Giants.” The “Giants” can be societal ills, injustice, inefficiency, depravity, disability, and all forms of defects or deficiency that we face individually, corporately, and even globally. How can Technology help tackle such “Giants”? For the hack-a-thon track (July 10-11), we will gather to develop new technologies which will kick butts of these “Giants” facilitating innovation, transformation, and miracles! This track is open to Microsoft FTEs and interns ONLY. We encourage all disciplines to participate. Also, this CAN be the pre-hacking opportunity for Microsoft’s company-wide //oneweek Hackathon (July 27-29). Through our talents and creativity, we can transform our workplace, communities, cities and nations together! For the pray-a-thon track (July 10-11), there will be praise and worship, intercessory prayer for Microsoft, employees, customers and subsidiaries, and for the cities and nations. We cannot succeed just by our skills against the Giants in the world. We know the first step must be prayer. As David took down Goliath, The Giant, with the power of God, so we need this same guidance. This track also will include teachings and sharing on marketplace ministry, frontier missions, spiritual formation, testimonies of marketplace miracles, and more! This track is open to all Microsoft FTEs, interns, and guests. For kids’ hack-a-thon (only July 11 9am-10pm), kids will learn how to code and they will pursue ideas that would also tackle the Giants! This fun kids-centered event will teach how technology can facilitate miracles in the world. They will also learn about unreached people groups and nations, how they can pray for and how to help them. DiscoverBible helps people enjoy the whole counsel of God. Users start by entering a passage they are familiar with. After they read it, they click next to see a related chapter they have not read yet. The system uses topic modeling with non-negative matrix factorization to automatically calculate relevance scores between chapters of the Bible. These scores, along with a vector of which chapters the user has already read are used to determine what chapter of the Bible someone will get next. You can think of DiscoverBible as an adaptive, automatically generated Bible reading plan that helps you enjoy all of God's word, not just the parts you are already familiar with. Scripture Insight provides a social reading experience where people can see what verses are important to the Body of Christ (based on Bing Search Volume data) as well as what verses may be overlooked. And this helps people pay attention to everything God is saying, not just the passages we like. The Visual Studio Scripture Integration leverages the FaithLife API to create a TypeProvider that makes Scripture content and data easily accessible to F# developers (via Intellisense). If you’re a data scientists or developer you can easily write programs with Scripture content, whether for textual analysis, natural language processing of Scripture data, etc. For example, you can calculate term frequencies for a passage of the Bible with one line of code. We will be providing 4 meals from Friday 7/10 dinner to Saturday 7/11 dinner, and endless snacks. Please help us to provide you with quality food without any waste or being short! For parents of Kid’s hackathon, please order your kids’ food as well. The challenge for this year&apos;s //oneweek hackathon (and also our current mission statement for Microsoft) is "Empower every person and every organization on the planet to achieve more." Your project must be aligned with this theme. More specifically, think about some of the obstacles, aka the "Giants" that prevents this empowerment and how you can tackle these Giants with technology creating life-giving and life-transforming miracles in the world. Please come prepared with your own project idea at the event so that you can recruit a team to work on it. This venue will remain open around the clock. Participants are encouraged to utilize the facility and take advantage of the meals and endless snacks, healthy activities day and night, if desired. Please bring your laptop, pajama or comfies, toiletries, sleeping bag, pillow, blanket, etc, all the hard-core hacking stuff! There are shower facilities and towels in the building. 12:00 PM - 1:00 PM Lunch & Roundtable Discussion "Marketplace Miracle Makers"
7:30 PM - 8:00 PM Keynote: "Unleashing the Power: From the Marketplace to All Nations"
As a body of Christ in Microsoft, we will seek God"s face together and tackle the Giants through our prayer. This track includes praise and worship, intercessory prayer, teachings, and testimonies! Open to all Microsoft FTEs, interns, and guests. 1:00 PM - 3:00 PM "The Back to Jerusalem Vision and Prayer for All Nations"
3:15 PM - 3:45 PM "How to Disciple/Raise Marketplace Ministers"
3:45 PM - 4:15 PM "The Role of the Local Church in Marketplace Miracles"
In this track, kids will learn how to code and how to code to tackle the “Giants” in the world. The bible says Children are like arrows in a warrior's hand, which will attack the “Giants”. They will also learn how technology can facilitate innovation, transformation, and miracles in our communities and round the world. This track is open to kids of MS FTEs, from 1-6th grade, and they MUST be supervised by their parent/guardian at all times throughout the event. All kid participants are to bring a laptop! Loaner laptops will be available upon request, but the number is limited. 11:10 AM - 12:10 PM Coding Class 1 "Coding Fundamentals"
2:00 PM - 3:00 PM Coding Class 2: "Advanced Coding"
3:00 PM - 5:00 PM Hackathon with Raspberry Pi "Miracle Makers"
We are excited to have your kids participating in the Kid’s Hackathon! You must be MS FTEs and you will be asked to sign a “Release for a Minor” document when you check-in. To comply with the company policy, please ensure to supervise them at all times throughout the event. Also, please make sure each of your children to bring a laptop. Loaner laptops will be available upon request, but the number is limited. Looking forward to seeing you and your wonderful children! Meet with Mentors to get feedback and insight on your concepts and products. Schedule your sessions with mentors of your choice on Friday/Saturday and get connected. Who is organizing the 2015 Code for the Kingdom at Microsoft event? It is being organized by MMFM @ Microsoft (Marketplace Missionaries For Frontier Mission) in collaboration with Leadership Network and TheoTech. Yes, absolutely. This event is open to all Microsoft FTEs and interns. What if I am not a technologist? Yes – We will provide dinner on Friday Jul 10th and breakfast, lunch, and dinner on Saturday Jul 11th. Make sure you order your food here. I am new to hacking. Where can I find resources for hacking? With the same project at this hackathon, can we extend/continue hacking at the Microsoft company-wide //oneweek Hackathon on July 27-29? Absolutely Yes. All Microsoft FTEs/Interns are more than welcome to pre-hack at this MMFM hackathon, and extend/continue the same project at the company-wide //oneweek hackathon. For company-wide hackathon, many teams are pre-hacking. Feel free to take advantage of this MMFM hackathon to pre-hack for the company-wide //oneweek hackathon. The only requirement from the company is you need to register your team and your project at //oneweek hackathon site, and during the company-wide hackathon from 7/27 noon – 7/29 noon (some time during this 48 hours), your team need do to at least some amount of work, which could be more coding, debugging, and/or improving presentation, etc. Yes! As long as there are more than 3 teams, we will give $500 to the winning team. I am participating in the Hackathon Track (Track 1). What do I need to bring? Your laptop is a MUST. If desired, comfies, pajama, blanket, sleeping bag, toiletries, etc, that will make you non-stop for hacking! I am participating in the Prayathon Track (Track 2). What do I need to bring? Bible, your journal, if you wish. If desired, comfies, pajama, blanket, sleeping bag, toiletries, etc, that will help you pray late night or early morning! I am participating in the Hackathon Track (Track 1), can I check-out the Prayathon Track (Track 2)? Of course. Feel free to drop by any time, esp. when you are stuck, need wisdom from God, ask prayathon people to pray for you and get refreshed! I am participating in the Prayathon Track (Track 2), can I check-out the Hackathon Track (Track 1)? Of course. If you are curious, feel free to drop by any time, esp. when you want to pray for the participants. Note that Hackathon Track is for MS FTE only and all non-MS guests must sign NDA before entering the event site. I am a parent for the Kid’s Hackathon Track (Track 3), what should my kid bring? A laptop per kid! There will be a few loaner laptops but the number is limited. Also make sure you order your food and your kids’ food.